IMMATERIAL curated by Marina Abramovic, opens on October 26th, 2011 at a fairly new online exhibition platform and marketplace found at Paddle8.com The exhibition is the fourth of it’s kind in this virtual location and takes a cue from Marcel Duchamp’s 1917 work titled Fountain. As an online marketplace, Paddle8 brings together various artists from several top international galleries as a platform for an exhibition experience that all can see (or join) with the click of a mouse. No more white walls, no more mapping the address of a gallery space. Paddle8.com offers the viewer the opportunity to view a curated selection of artwork in the comfort of their own home, office, or studio. Courtesy of Monitor Gallery and the artist. 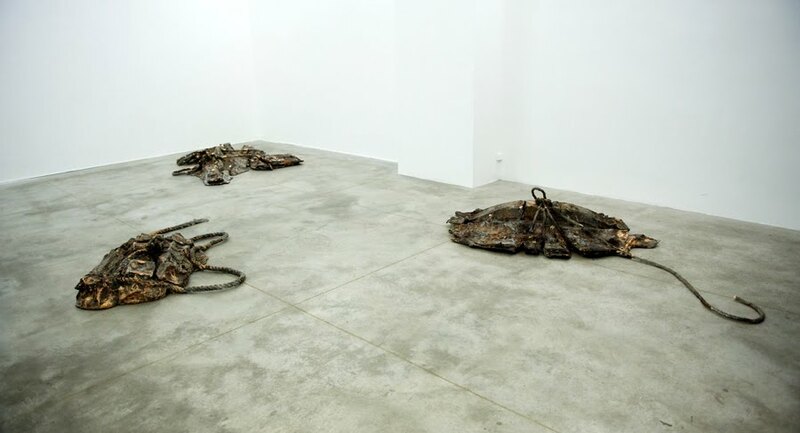 A group exhibit, IMMATERIAL brings together artists both contemporary and otherwise. It offers a selection of works that communicates within the realm of art outside of beauty. Presenting a cross section of some of the best contemporary young artists working today (David Adamo, Nico Vascellari, Terence Koh) along with more established names (Francis Alys, Yves Klein, Piero Manzoni) IMMATERIAL invites the viewer to make his or her own conclusions or hypothesis on both the influence of the past and the current state of what contemporary art has to say now in response to what has come before. Leaving the pressure of representation behind, radical movements of artists focus on object and form instead of likeness. 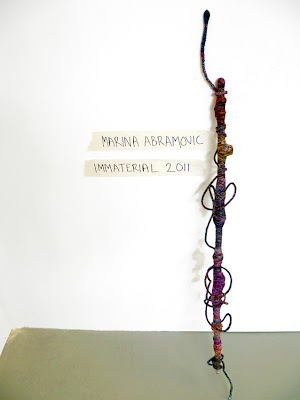 The artists in IMMATERIAL strive to bring attention to what could so easily go overlooked. Once he/she has your attention, is only when the realization will occur that within an open realm of interpretation, memory and individual response is all part of the work itself. David Adamo, is an American artist currently based in Berlin. 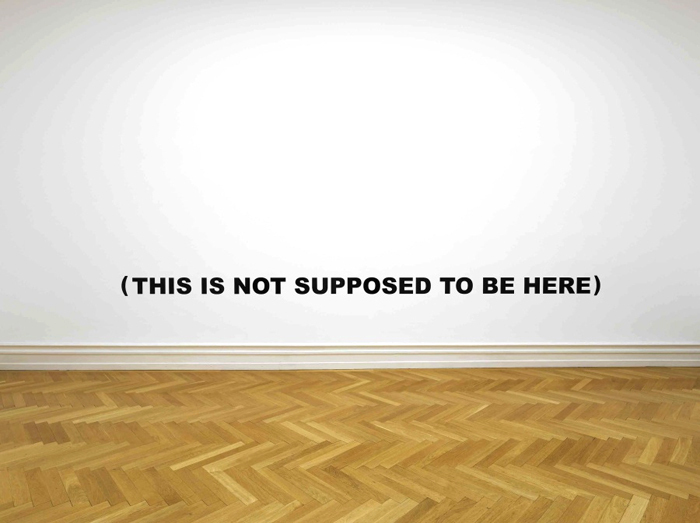 For this exhibition courtesy of Ibid Projects and the artist he has contributed Anniversary Waltz, a video from 2007. 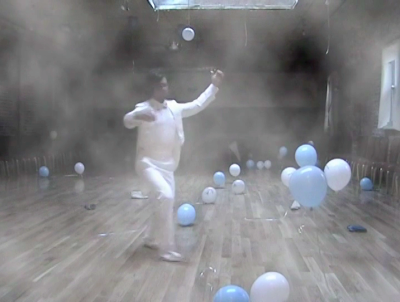 In the video the artist performs the waltz solo, in a room of balloons that have already and are in the process of losing helium. The possibility for narrative is endless. However stoic Adamo’s performance is, he moves with grace, sans shoes, and strides amongst the balloons in a slight foggy haze. Had there been a party? A high school prom? Was the artist present and left behind? The questions are endless and as the music plays and the artist spins, one might find themselves lost in a moment, following Adamo’s movement and forgetting where his partner may or may not be. Anyone familiar with David Adamo’s current projects will know that he is now making installational sculpture, deconstructing objects and rendering them useless. The video is an important remnant leading to his current oeuvre and it’s lovely to see variation of theoretical approach and medium.